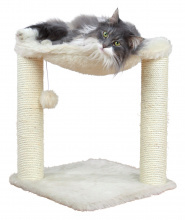 The best cat condos, cat trees, cat playhouses, whatever you choose to call them, are an active cat’s home inside a home, a spot just for them where scratching is allowed (even encouraged!) and they can curl up and hide away or run in, out, around, and on top of it like the wild thing that we all know is still somewhere inside. There are some really fun options out there. 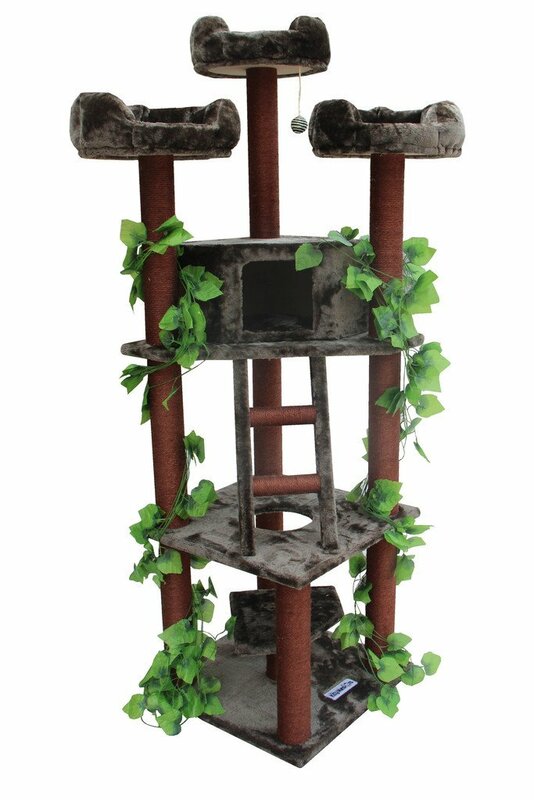 Here are some of our favorite cat trees/cat condos. Hey, if you’re going to call it a cat tree, make it look like a tree! This is part of Kitty Mansions Forest line of cat furniture. 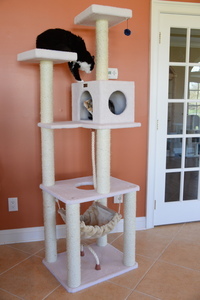 The sisal-wrapped posts are hung with “foliage” and replaceable, should your feline manage to claw through the covering. It provides five levels, including a snug “bedroom” and three different platforms, for perching or snoozing. The base is 23 inches, it rises up 75 inches (more than 6 feet), and it weighs in at 75 pounds. Yes, that’s a lot but it also means it’s stable. The base of this is 27 x 24 inches, with a height of 73 inches. Again, you have five levels, with two platforms, a hidey hole where kitty can chill but still keep an eye on everything, plus multiple ropes and swing toys to bat at. The posts are wrapped in sisal, the platforms are plush. Our favorite feature is the kitty hammock on the lower level. We’re thinking of installing a human-sized one here at petswelcome. Sometimes less is more. 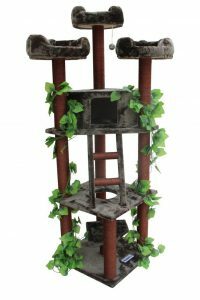 This cat tree is compact, 16 inches square at the bottom and just 20 inches high. The posts are wrapped in sisal, there’s a dangling pompom for smacking around, and a comfy plush sleep hammock on top. This one weighs in at just ten pounds. And finally, here is our pick for multi-cat families. 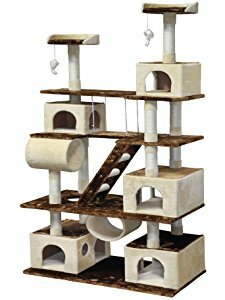 There are six levels, including two perching/sleeping platforms, as well as five “condos,” two plush tunnels kitty can jam herself into, and two danglers for batting. All the posts are sisal wrapped. The base is 42 x 23.5 inches and this one is super tall, 87.5 inches (more than 7 feet tall, so make sure your ceiling is high enough! ), and it weighs in at 137 pounds.